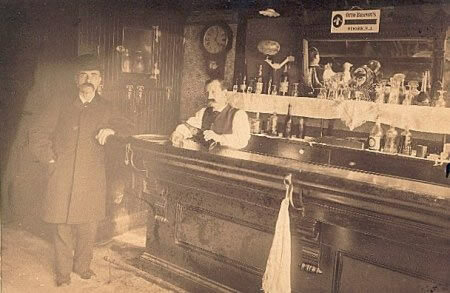 The man in front of the bar is Edward M. Hill and the man behind the bar is his wife's brother Charles Straley. There were three Brandt Brothers who were bottlers in Newark. Otto Brandt bottled soda and mineral water from the late 1800's to 1910. Albert Brandt had a bottling plant on Broad Street. Conrad Brandt's bottling plant was at 37 William Street from 1879 to 1883. Otto Brandt, Manufacturer of Mineral Spring Waters, No. 287 Washington Street. — Mr. Otto Brandt is at the head of the manufacturers of this class of beverage in Newark and the most extensive manufacturer in the business. He has been established for over a period of fifteen years, he having founded his enterprise in 1867. The factory is a brick building of two stories, 18x55 feet in extent, and fitted with all the necessary appliances for the trade. The stock carried is estimated at $22,000 and consists of a large number of Mathews' fountains, etc. Seventeen experienced hands are employed in the various branches of the house and five wagon are kept in the delivery of goods. The trade done covers three of the adjoining counties to Newark, the sales reaching fully $35,000 per annum. Mr. Brandt is a German by birth and has been twenty-one years a resident of the United States, fifteen years of which he has spent in Newark in the development of his business. He has won an enviable rank in the social and commercial circles of his fellow-citizens.